Dr. Anish Mammen is a board-certified gastroenterologist and advanced therapeutic endoscopist who believes in utilizing both holistic and interventional therapies to optimize his patient’s health and well-being. After graduating from Tufts University Medical School in Boston, Dr. Mammen completed his internal medicine residency at Mt. Sinai Beth Israel Medical Center in New York City. He became fascinated with the human digestive system and decided to specialize in gastroenterology. He completed his GI fellowship at Lenox Hill Hospital in NYC, and continued on for a second fellowship in advanced therapeutic endoscopy under the mentorship of world-renowned expert Dr. Gregory Haber. Dr. Mammen has presented original research at international conferences, published peer-reviewed articles in academic journals, and authored a chapter on advanced endoscopic techniques. 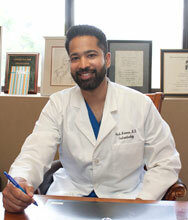 Dr. Mammen prides himself on providing highly personalized and comprehensive care. His interests include acid reflux (GERD), gastritis, Barrett’s esophagus, inflammatory bowel disease (IBD), Crohn’s disease, ulcerative colitis, hepatitis, disorders of the bile duct, large polyps, colon cancer, gastric cancer, esophageal cancer, hepatocellular carcinoma (HCC), cholangiocarcinoma, pancreatic cancer, pancreatic cysts, pancreatitis, pseudocyst drainage, Celiac disease, nutrition, weight loss, non-surgical bariatric endoscopy, gastric balloons, endoscopic sleeve gastroplasty, advanced interventional endoscopy, colonoscopy, enteroscopy, ERCP, endoscopic ultrasound (EUS), fine needle aspiration (FNA), endoscopic mucosal resection (EMR), BARRX radiofrequency ablation (RFA), cricopharyngeal myotomy, Zenker’s diverticulum.